An all-new Swedish team has been created to enter the 2016 FIA World Rallycross Championship. 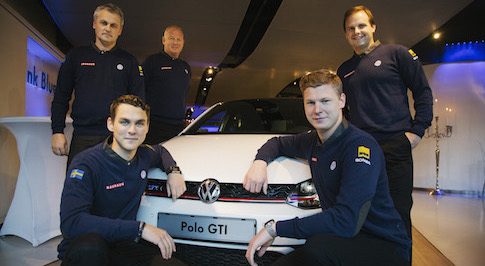 Comprising of the former Marklund Motorsport and Volkswagen Team Sweden, the team has drivers Johan Kristoffersson and Anton Marklund set to pilot a pair of Volkswagen Polo RX Supercars. Both teams had a successful racing record, with Marklund Motorsport finishing second in both the drivers' championship and the teams' championship in 2014, while Johan Kristofferson of Volkswagen Team Sweden finished third in the overall 2015 driver standings. Jost Capito, Technical Director at Volkswagen Motorsport, explained the process behind the merge: "Volkswagen Motorsport is positive about the merger that came about as a result of the team's initiative. A collaboration between Marklund Motorsport and Volkswagen Team Sweden will strengthen Volkswagen's position in one of the fastest growing areas of motorsport. Combining our capabilities will create good possibilities for further success in the sport." The team is a collaboration with Volkswagen Sweden and the new cars will be built at Marklund Motorsport's premises in Boliden, whilst the Volkswagen Team Sweden is based in Arvika.